The pursuit of artificial intelligence has been a highly active domain of research for decades, yielding exciting scientific insights and productive new technologies. In terms of generating intelligence, however, this pursuit has yielded only limited success. This book explores the hypothesis that adaptive growth is a means of moving forward. By emulating the biological process of development, we can incorporate desirable characteristics of natural neural systems into engineered designs and thus move closer towards the creation of brain-like systems. The particular focus is on how to design artificial neural networks for engineering tasks. 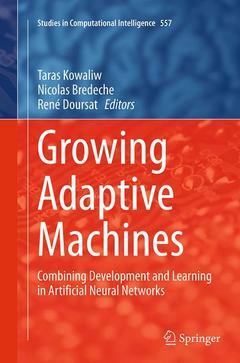 The book consists of contributions from 18 researchers, ranging from detailed reviews of recent domains by senior scientists, to exciting new contributions representing the state of the art in machine learning research. The book begins with broad overviews of artificial neurogenesis and bio-inspired machine learning, suitable both as an introduction to the domains and as a reference for experts. Several contributions provide perspectives and future hypotheses on recent highly successful trains of research, including deep learning, the Hyper NEAT model of developmental neural network design, and a simulation of the visual cortex. Other contributions cover recent advances in the design of bio-inspired artificial neural networks, including the creation of machines for classification, the behavioural control of virtual agents, the design of virtual multi-component robots and morphologies and the creation of flexible intelligence. Throughout, the contributors share their vast expertise on the means and benefits of creating brain-like machines. This book is appropriate for advanced students and practitioners of artificial intelligence and machine learning. Artificial neurogenesis: An introduction and selective review.- A Brief Introduction to Probabilistic Machine Learning and its Relation to Neuroscience.- Evolving culture versus local minima.- Learning sparse features with an auto-associator.- HyperNEAT: the first five years.- Using the GReaNs (Genetic Regulatory evolving artificial Networks) platform for signal processing, animat control, and artificial multicellular development.- Constructing complex systems via activity-driven unsupervised Hebbian self-organization.- Neuro-centric and holocentric approaches to the evolution of developmental neural networks.- Artificial evolution of plastic neural networks: A few key concepts.